I came back from work yesterday night and Jonathan came with a pitiful face complaining to me that he mouth is pain because he bit his tongue. Immediately it came to my mind to check on his hands and legs because he had never bitten his tongue before. 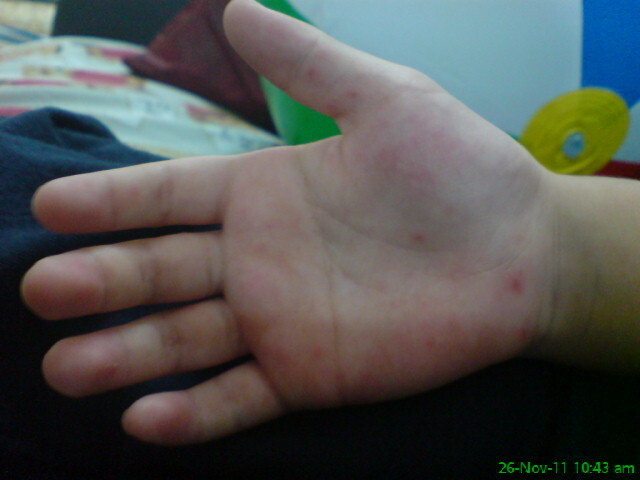 There it is…red spots and and some tiny blisters on his palms and feet. I can’t see clearly if there are any in his mouth but none on his lips. Immediately we bring him to see the pediatrician. She examined him and confirmed that it’s HFM disease. She gave us the medicine for his mouth and calamine lotion. Jonathan looks alright so far. He is still moving around but a bit restless. He is not bothered by the blisters in his mouth, palms and feet. We went for dinner after that and he can still finished his rice with bak kut teh soup. I had to lie to him that if he is not eating, we have to spray the medicine in his mouth. Praying hard that his condition won’t get worst the next day. Praise the Lord, he wakes up this morning greeting me good morning. Gonna feed him some cooling stuff to clear the heatiness. So there goes our long weekend…at home. Hopefully he recovers fast because we are flying off to paradise the week after next. This entry was posted on Saturday, November 26th, 2011 at 11:58 am and is filed under Health Care, Jonathan. You can follow any responses to this entry through the RSS 2.0 feed. You can leave a response, or trackback from your own site. i’m sure Jonathan will be fine for your holidays. enjoy yourselves! Pity.. Hope he fully recovered by now..
Hope he has got well by now.